Terrorism is defined by The Encyclopædia Britannica as the systematic use of violence to create a general climate of fear in a population and thereby to bring about a particular political objective. Do you know someone who travels but is vague about where they are going? Have you seen anyone taking pictures of security arrangements? Have you seen someone with large quantities of mobiles? 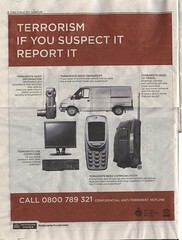 Do you know someone who visits terrorist-related websites? I think that such advertising is intended at creating a general climate of fear. It is far more efficient than killing 2 or 3 people with a small bomb to spread fear, and you won't be arrested for publishing that ! Samuel Hocevar is the new Debian Project Leader. I'm sure he will be a great DPL ! I have just read a presentation by guys from Intel and RedFlag called "Designing for Linux-Based Mobile Internet Devices" to be given next week. They present the work they did over the last 2 years to create a new Linux distribution for Ultra Mobile PC. Part of their constraints where: less than 512MB on disk, works well with less than 256MB RAM, cold boot < 20s, resume from standby < 5 sec, screen between 800x480 and 1024x600. They did a lot of optimization (like the GRUB hack to jump to the recovery point without booting the kernel in order to speedup resume from 5.7s to 3.2s) and plan to do some more. I had been looking for that for some time, even started coding it, and today I found it. mfstool does not show up on Google when searching with keywords like minix, user-space... , is not listed in Freshmeat, but is exactly what I needed ! Mandriva 2007 Spring is out! The new Mandriva release is out, including GNOME 2.18 and Metisse. A more complete tour is available on the wiki. The iso are appearing, packages are already on the mirrors and Cooker is already alive. As usual a Free (as in beer and speech) version is available, but this time the One (installable Live CD) is only available in non-free versions (There are GNOME and KDE versions for i586 and x86_64, but all include proprietary drivers). Vincent added Mandriva svn to CIA, and we immediately got listed as the most active project ! I'd like to switch from Evolution to the light but powerful Claws Mail but did not for only one reason : the lack of integration into GNOME. 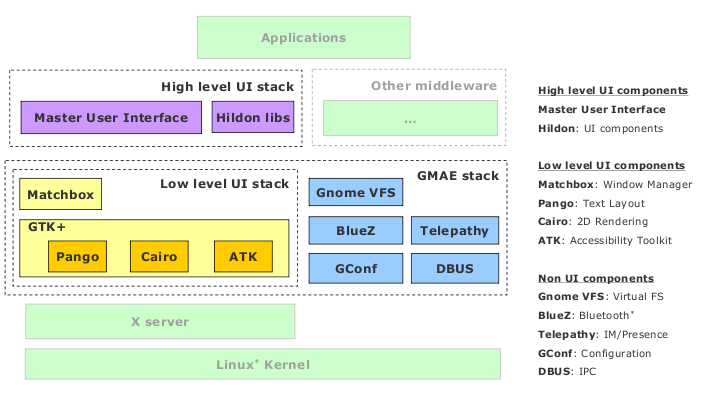 GNOME uses evolution-data-server to store everything so that all apps can access data. This allows nautilus-sento to know your contacts, the date applet to know your calendar and tasks, ... Now that we have light interfaces to manage e-d-s data thanks to OpenedHand guys, dropping evolution is even more tempting so I'd like to have Claws Mail to use this data. Have e-d-s to know Claws Mail contacts (reading ~/.claws-mail/). If only implementing this, you will need to import your current contacts into claws to be able to use them. This part is about adding to you calendar the events you receive by mail. That's more easy, vcalendar support is already a plugin so another one can be written to use e-d-s. The goal is to have the same functionality as Evolution's "Convert to task". This one is really easy as we only need the dialog to select the category and it already exists in Evolution.